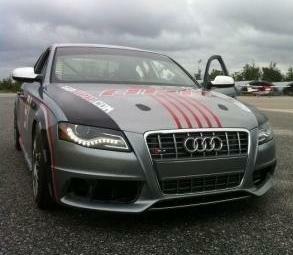 APR Motorsport began testing the brand new Audi S4 with Josh Hurley at the helm early last week at Auburn airport. Getting the car ready for this weekend’s race at the Mid-Ohio Sports Car Course has been a race against time, and once again the team has delivered. While the test was originally scheduled for a true racing facility, tropical storm Lee had other plans. When the storm had shut down the area’s track, APR Motorsport got creative. Using the good will they had developed within their community, the team was able to secure a large portion of the Auburn airport for testing. Josh Hurley was there to conduct the testing for the team. “I’m really proud of the team for getting the car ready, and for finding a way to test the car despite the storm. It’s been a tough time with the previous Audi but we’ve learned a lot, and that knowledge is evident in the new car,” said Josh at the end of the test day. 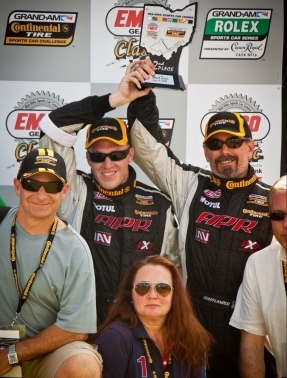 Josh Hurley and the Fortis Watches–Perfect Pedal–APR Motorsport crew have had a great history of success at Mid Ohio. However, last year the team suffered an initial setback in qualifying, which forced them to start in 24th position. After 30 minutes of racing, the team called to have Kevin Stadtlander come into the pits to turn the car over to Josh Hurley. Josh then began to move up the field, and after only 40 minutes, Josh had taken the lead. Sadly the lead wasn’t to last. With only 20 minutes left in the event, a competitor in another class spun just in front of Josh’s Fortis Watches-Perfect Pedal-APR Motorsport Volkswagen. With nowhere to go, Josh stuck the other car, damaging crucial duct work in the front of the car. Despite the damage, Josh was able to nurse the car home to an excellent 2nd position, netting a Hard Charger award for gaining the most positions, as well as leading the most laps. So with past history on their side, look for Josh Hurley and the entire Fortis Watches-Perfect Pedal-APR Motorsport crew to be challengers throughout the weekend at the Mid-Ohio Sports Car Course in Lexington. If you’re in the area make sure you come watch as the Fortis Watches–Perfect Pedal–APR Motorsport team take on the competition in their new Audi S4.